Colour-coded 3G chain blocks up to 5-tonne. THE latest range of colour-coded 3G industrial chain and lever blocks from Beaver Sales offers a new system of identification for hoisting and lifting that makes choosing the correct capacity block easier and safer. This is particularly important when working in harsh or muddy environments where rated capacity "ID" plates on this type of equipment can become obscured or severely damaged. The chain and lever blocks are suitable for applications in the mining, construction, engineering, and logging industries. 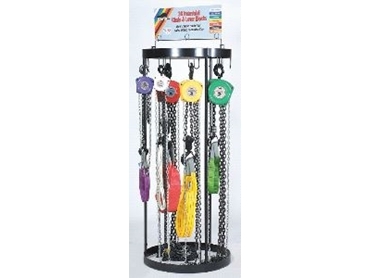 The 3G colour-coded chain and lever blocks are matched with the international colour code for synthetic lifting slings, ensuring the correct capacity for both chain or lever block and lifting sling. The chain blocks can be supplied in 500kg (white), 1-tonne (violet), 2-tonne (green), 3-tonne (yellow) and 5-tonne (red) capacities. They also have improved design features to ensure full protection of the vital gears, shafts, and bearings. The side covers are made from reinforced heavy duty steel and the load chain is calibrated alloy Grade T(80) material which guarantees safety when lifting loads. The industrial strength bearings ensure minimum lifting effort even under full load, and the hand chain is supplied in an electro-galvanised (silver) finish. Among other features the 3G industrial chain blocks have a Weston type friction braking system with high strength twin pawls for additional safety. The roller chain guides, top and bottom, help eliminate tangling and jamming of the load chain, ensuring trouble-free service. A revised design ball bearing retention system, on the top and bottom hooks, ensures a safe coupling. Both hooks swivel and are fitted with cast safety catches. The New Generation 3G industrial chain lever blocks are also colour coded. The 500 and 750kg capacity types are white; 1.5-tonne violet; 3-tonne yellow; and the 6-tonne capacity brown. The chain lever block mechanisms and gears are enclosed in a robust all steel compact shell. The load chain is made of high resistance alloy Grade T(80), black finished, heat treated and calibrated. All gears and shafts run on roller bearings and the gear ratios allow maximum loads to be raised with minimum effort and ensuring maximum safety. In the case of both 3G chain blocks and 3G chain lever blocks, traceability is by means of an individual serial number which co-relates to the test certificate. The 3G chain & lever blocks are individually tested to their rated capacity and are supplied with a Beaver test certificate. Beaver ID plates and rivets are supplied in stainless steel in order to avoid dangerous sparking. In addition, a yellow plastic safety and warning cylinder is supplied with all chain blocks. Contact Beaver Sales on 1300 783 606 or visit www.beaver.com.au.